A 'happy camper' astronaut gives a thumbs-up for a chocolate treat delivered to the ISS. Update: The launch scheduled to take place on November 11 to resupply the ISS was aborted due to aircraft in the restricted area. Next launch attempt is November 12, 2017 at 7:14:52 a.m. EST. Imagine waiting for supplies, whether for tools for the ongoing care and maintenance of the International Space Station (ISS), or for a favorite treat, the astronauts are at the mercy of the cargo spacecraft that shuttles the supplies to them. This week another launch is scheduled to bring these items to the astronauts including small sats that will be used to conduct experiments aboard the ISS. NASA's commercial cargo provider Orbital ATK is scheduled to launch its eighth mission to the International Space Station at 7:37 a.m. EST Saturday, November 11 NASA’s Wallops Flight Facility in Virginia aboard the spacecraft, named the S.S. Gene Cernan after former NASA astronaut Eugene “Gene” Cernan, who is the last person to have walked on the moon. Cernan died in January of this year. The S.S. Gene Cernan will deliver scientific investigations including those that will study communication and navigation, microbiology, animal biology and plant biology. Live launch coverage will begin at 7 a.m. on NASA Television and the agency’s website. NASA TV also will air two prelaunch briefings Friday, November 10. At 11 a.m. mission managers will provide an overview and status of launch operations, and at 3 p.m. scientists and researchers will discuss some of the investigations and technology demonstrations to be delivered to the station. 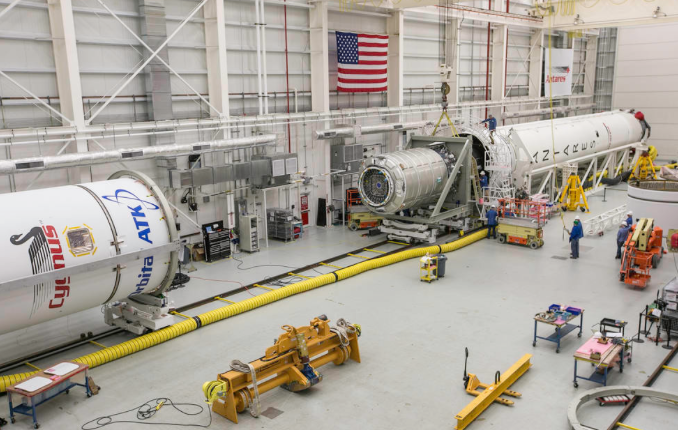 Orbital ATK’s Antares rocket for the CRS-8 mission is being integrated in the Horizontal Integration Facility at NASA’s Wallops Flight Facility. The Cygnus cargo spacecraft will launch on Orbital ATK’s upgraded Antares rocket from Pad 0A of Virginia Space’s Mid-Atlantic Regional Spaceport, located at Wallops. Following launch on November 11, NASA TV coverage of the spacecraft’s solar array deployment will begin at 9 a.m. and a post-launch news briefing will held at approximately 10 a.m. Under NASA’s Commercial Resupply Services contract, Cygnus will carry about 7,400 pounds of crew supplies and hardware to the space station, including science and research in support of dozens of research investigations that will occur during Expeditions 53 and 54. Cygnus will carry several CubeSats that will conduct a variety of missions, from technology demonstrations of laser communication and increased data downlink rates to an investigation to study spaceflight effects on bacterial antibiotic resistance. Other experiments will advance biological monitoring aboard the station and look at various elements of plant growth in microgravity that may help inform plant cultivation strategies for future long-term space missions. The spacecraft will also transport a virtual reality camera to record a National Geographic educational special on Earth as a natural life-support system. Cygnus will arrive at the station on Monday, November 13. Expedition 53 Flight Engineers Paolo Nespoli of ESA (European Space Agency) and Randy Bresnik of NASA will use the space station’s robotic arm to capture Cygnus at about 5:40 a.m. NASA TV coverage of rendezvous and capture will begin at 4:15 a.m.
After Canadarm2 captures Cygnus, ground commands will be sent to guide the station’s robotic arm as it rotates and attaches the spacecraft to the bottom of the station’s Unity module. Coverage of installation will begin at 7 a.m.
Cygnus will remain at the space station until December 4, when the spacecraft will depart the station and deploy several CubeSate before its fiery reentry into Earth’s atmosphere as it disposes of several tons of trash. Learn more about Orbital ATK's mission here.